Serhan makes ancient Turkey come alive and he guides you through the energy and dynamism of today’s Turkey. I was lucky enough to spend a week in 2004 with Serhan as my guide while I was researching a book on the Trojan War. He offered new insights on sites I thought that I already knew, he took me to places that I had been waiting years to see, and he introduced me to spots that I didn't even know existed. Serhan’s knowledge is vast and his generosity in sharing it is unlimited. I met him again when I was in Istanbul in summer 2005 and, once again, Serhan showed me a city and a Bosphorus that I could never have found on my own. Serhan has been invaluable to my research. And he just plain made my work fun. I hope to be lucky enough to have him as a guide in the future and I recommend him wholeheartedly to any visitor to Turkey. You put us all very greatly in your debt for the tremendous pleasure, intellectual excitement, curiosity, sense of awe, and love for Turkey which you inspired in each and every member of the OAT group. This was a superb tour and its very success was largely attributable to your professionalism, commitment, experience and true leadership fully worthy of a former officer in the marines. As a historian I greatly admired your command of history and, even more important, your sense of history and feeling for history. I was constantly impressed by your ability to see the “big picture” and yet to be fully aware of the small things which are so important. It was your ability to move from the macro to the micro so fluidly and easily that I found fascinating. Impressive too was your command of what the French historian Braudel called the longue duree. In other words, to move across the centuries and situate events in this long span of time and have the insight to see what we know now to have been truly important and to throw away those whose importance was, with hindsight, merely transitory. Hannelore and I were traveling recently and she was reminded of your famous saying, when looking out over the fields of Cappadocia, “ ... and the women have been cultivating these lands for 9,000 years”. Truly impressive is your sensitivity to history and its many peoples and your ability to explore the twin themes over millennia of continuity and discontinuity down to the present day. I was intrigued to learn about your perspective on the role of the Ottomans in the protection of the holy sites of Medina and Mecca and their provision of fortresses to protect but also of caravansarais for pilgrims. Because of my studies of the Portuguese and the Mughal rulers, I was very much aware of Muslim Indians making the hajj. Sunni pilgrims from India also took the land route, in part to avoid attacks by Portuguese naval vessels, but this did not spare them from being harassed by Shiite rulers in Persia. Ottomans and Mameluks protected such pilgrims also from the roving Bedouins. A fascinating history and a fascinating present. Late Professor of History, Johns Hopkins University. Serhan guided Mrs. Meryl Streep during her visit to Istanbul in August 2009. In spring 2007, Serhan guided Mr. Rick Stein, in the production of the BBC series Rick Stein's Mediterranean Escapes. He also contributed to the program as a researcher and consultant on Turkish cuisine. For eighteen days in May of 2006, members of the Boston Museum of Fine Arts traveled through Turkey. Navigating the trip for us was Serhan Gungor, a freelance, licensed tour guide. Thanks to Serhan’s efforts, the trip was a total success. For this reason I am writing to recommend him to readers of The Hideaway Report. We have been avid fans of this excellent journal since my father gave a subscription to my husband over thirty years ago. I thought this recommendation would be of use to anyone considering a visit to Turkey in the near future. Our trip took us from Ankara to Istanbul, a journey of approximately three thousand miles. Though it was not a typical “Hideaway Report” getaway (thirty people plowing through Turkish cities and countryside in a large bus), Serhan made each day incomparable. While in Cappadocia, for example, after a nocturnal performance of whirling dervishes, Serhan lured us to an improbable place. The bus drove us to a ledge behind which an inn was carved out of the hillside. From this vantage point we could look across the valley and see the ghostly spires of lava rock in the moonlight. While his friend the innkeeper played the guitar, Serhan sang haunting folk tunes. This was only one of many surprises that Serhan engineered for our pleasure and delectation. We arrived at the ruined ancient city of Ephesus as the sun was about to set. Though Ephesus had been our destination earlier that day, Serhan engineered our arrival time to coincide with the waning of the day. Thus at one of the most visited sites in Turkey, there were only a handful of other visitors besides us. As Serhan guided us through the streets, the light reflecting off the stones made the old city glow. We listened to Serhan’s informed lecture, overwhelmed by the colors, the quiet, and the sheer beauty of the monuments and their setting. Though sticking to the itinerary, Serhan still managed to take detours to capture unforeseen, spontaneous opportunities. Urging our bus driver through thickets of olive groves we found ourselves at the temple of a local Zeus; another dirt road brought us to the Temple of Hecate, a fertility goddess later associated with the underworld and witches. Under the watchful eye of the lone guardian at each site, we listened to Serhan speak of ancient devotions, mystery, and romance in modern times. The skills of our clever “navigator” were bested only by our visit to Hagia Sophia in Istanbul. Has anyone ever been fortunate enough to visit Hagia Sophia without another soul present in the building? We did. Under the largest dome of its time, we wandered undisturbed while Serhan described the achievements of its Christian and Muslim architects. Our trip was all inclusive with hotel accommodations and meals included. However, our lunch destinations were entirely at Serhan’s discretion. Cell phone to his ear, Serhan would notify one of his many friends in the restaurant business that the bus was on its way, and upon our arrival we would be scooped up by attentive staff and led to crisply set tables. Serhan generally ordered ahead and so the first course would arrive within minutes - fresh salad, soup, fish or lamb, chicken or beef prepared as a specialty of the region, and always dessert. On one occasion after a shopping spree in a leather goods workshop near Ephesus, we arrived at a nondescript building by the side of the road. Once inside, the restaurant opened up onto a terrace overlooking the sea. In an instant the owner produced grilled shrimp that had been fished out of the water five minutes earlier and were perfectly cooked. Leaving the ancient town of Phaeselis, we found ourselves driving through hilly countryside for miles, rather depleted, and looking longingly at the pots of honey for sale along the roadside. A quick turn off the main highway, the bus started climbing up a steep hillside through forests. Suddenly we spied several restaurants advertising fresh trout. When we got out of the bus rubbing our eyes, we glimpsed pools teeming with trout, some barely hatched, and others full-sized. While Serhan negotiated actively, we sat ourselves down at wooden tables next to the stream and began munching on steaming hot bread. Within a few minutes, the trout was fished out, baked in wood-fired ovens, and presented to us in individual clay dishes. We burst into delighted applause before tucking in. Serhan gave us lectures on Turkish history, politics, culture, and current events delivered in colloquial English, peppered with incisive witticisms and informed by his acumen. His background is impressive. Serhan studied English at TED Ankara College and Political Science in Middle East Technical University, Ankara. He did graduate work in Ottoman Social History at Bogazici University in Istanbul. While at university, he also worked as a private guide. During his military service where he served as a Marine Lieutenant and part-time protocol officer, he guided NATO officials on visits through Turkey. After a corporate stint at Wal-Mart, Serhan’s deep affection for his country and his desire to reveal it to others led him to become certified as an official guide by the Turkish Ministry of Tourism in 1996. In the decade that followed, his freelance activities as a guide have been myriad. His experience enables him to cater to the desires of individuals as well as groups. Serhan’s intellect profoundly enriched our experience of the country. However, it was his sense of humor and his ability to act both as therapist and lion-tamer that made us particularly glad to be in his capable hands. He handled all our concerns, requests, questions, and comments in a thoughtful, decisive, and frequently ingenious manner. 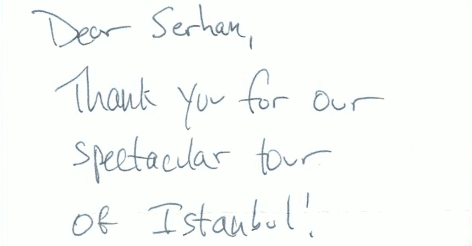 Serhan took care to leave no stone unturned to make our visit to Turkey a joyful, rich, transforming experience. That is why I wish to make this recommendation and why I believe a visit to Turkey is not complete without Serhan Gungor as the guide. It was such a joy and pleasure to meet you and to spend 14 wonderful days travelling in your beautiful country. I can not say how much I enjoyed it and how much I appreciate your historical and social knowledge. It made our journey very interesting and informative. I specially appreciated your deep sensitivity to the religious and spiritual dimension of our tour. Your contributions and insights were profound and I learned so much from you. I have been encouraged to reread my texts and notes on the early Church Councils, the journey's of St. Paul and, of course, my favourite, Mevlana Jallaladdin Rumi. For me personally, the trip was a pilgrimage of deep significance. Beside all that, it was a hell of a lot of fun and I enjoyed the laughter and the kibbitzing. I shall always remember our jam session at the hotel in Pamukkale - great music for a couple of amateurs, eh! 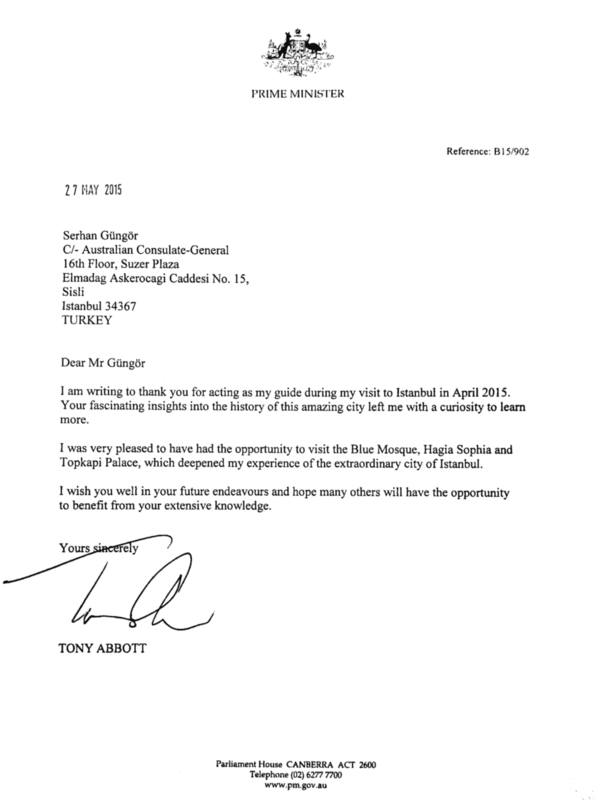 Just a note to tell how much I appreciate your hard work as our guide during my recent visit to your country. I have to admit to a certain amount of ignorance regarding Turkey and I was awed by the rich history, the beautiful people, and the amazing sights to be seen in your wonderful land. You helped make my experience in Turkey one I will remember with delight for as long as I live. I had great time clowning with you, but more than that, you made learning a fun experience. As an educator, I value that kind of teaching. You are a very capable and well prepared teacher and guide. 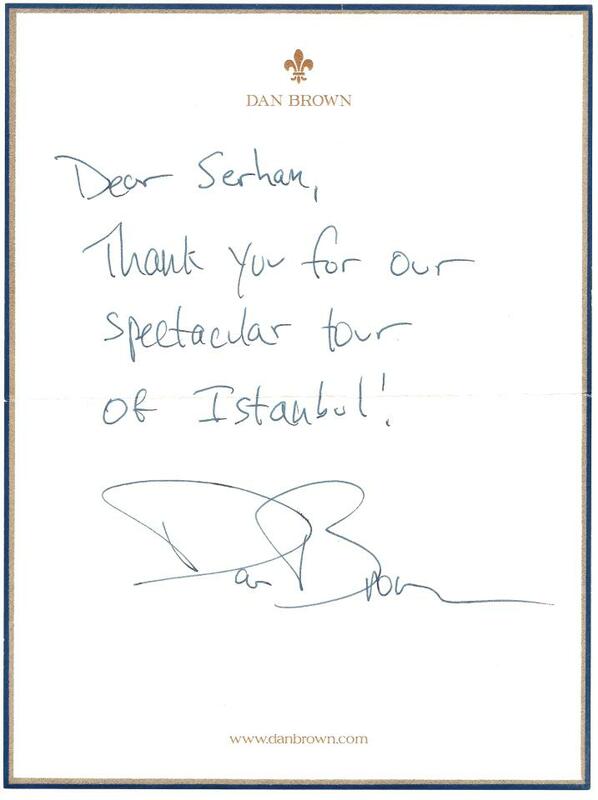 And Finally, I have to thank you for the wonderful time we all had in Turkey. Much of it was due to you. In addition to your enthusiasm for what is a wonderful country, you were fun to be with! Did I forget patience? The trip would not have been the same without you. Lynda and I came to Turkey as casual visitors on a holiday. Because of you, we are leaving with wonderful memories of an amazing country. Thank you for sharing with us your talents, your knowledge and your terrific sense of humor. We are very fortunate to have you as our guide. Hi! Serhan, This is Jerry Roussillon from Virginia Task Force One. To remind you of who I am, you worked with my crew when we got the 24 year old woman out and throughout other missions. I hope that helps you remember and I also gave you one of my business cards. Serhan we got home on Tuesday at 3:30 pm our time and 10:30 pm your time. Everyone is doing O.K. except for minor bruises and cuts and sore feet. I hope you are doing well! You were so valuable to our successful mission, THANK YOU! And always hold your head high for such a grand effort. I know your country still has a lot of tears and painful days ahead. I wish the time re-building passed quickly and as painlessly as possible. If I ever get a chance to come back to Turkey I will definitely look you up as a friend and tour guide. I wish for you to come to the U.S.A. and let me show you my homeland. Perhaps someday. Serhan thanks for all your help. You and your country are the true heroes. Keep your hopes alive and I wish you a speedy recovery.